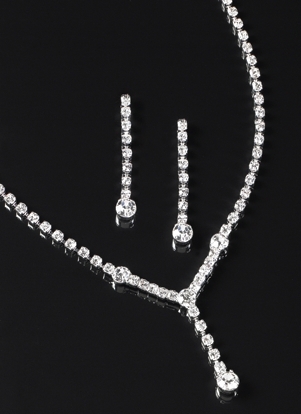 This set includes pierced drop earrings and 16 inch Y drop necklace with 2 inch extenders. This set is deal if you need to dress up a simple formal gown. The pierced drop earrings feature a long strand of dainty rhinestones that are accented at the bottom by a larger rhinestone to give it that little extra pizzazz. The necklace features the same larger rhinestone at each point to form the shape of a Y and has a lobster clasp closure. FWO Extras: Earrings are 1 3/4 inches long.